Caution!<br>Although extra care has been taken to remove all bones, some may remain. 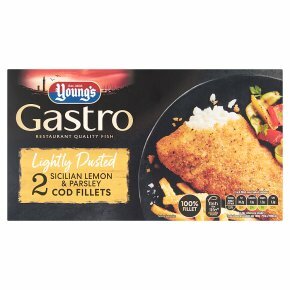 Our Sicilian Lemon and Parsley Cod Fillets are best oven baked straight from your freezer. Ensure product is piping hot throughout before serving.All appliances vary, these are guidelines only.200°C / Fan 170°C / Gas Mark 6Pre-heat the oven. Remove all packaging. Place product on a baking tray in the centre of the oven and cook for 24 minutes.